I am so excited about today’s budget or covet as I have lusted after the Chloe Lauren scalloped ballet flats for a long time. A couple of weeks ago, I even came close to buying them until I tried them on and they looked horrible on my feet. They made my feet look fat and just unattractive. Disappointed, I looked for similar styles and found a couple of pairs of affordable versions (here), but they were not made of real leather and I really wanted to find a comparable option that was leather and would last. Then last week, I came across the Augusta from Sam Edelman and ordered them. I got them earlier this week and they are perfect! They have the adorable scalloped edge and best of all look good on my feet! 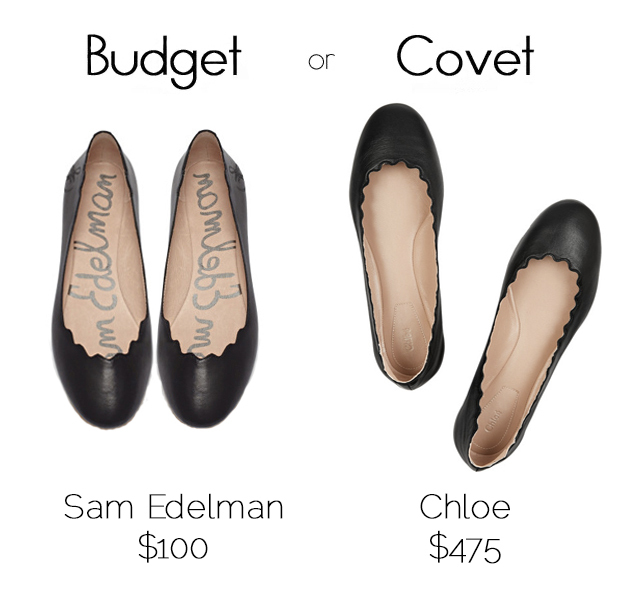 At a fraction of the price of the Chloe Flats, the Augusta flat by Sam Edelman are a fantastic, and in my case better, alternative and I could not recommend them more.